Any every organization needs meticulous management to be distinguished from the good ones to the best institution. This is the secret behind the success of any modern organization. So here is our School-College Management Solutions that helps to well manage every aspect of any educational institution like schools, colleges, and training institution. 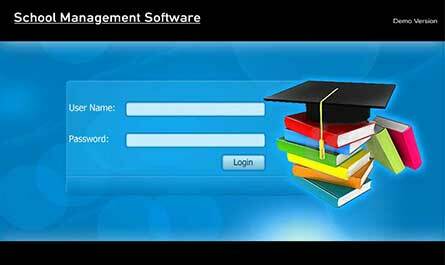 Our School Management Software is a totally customizable, multi-user Lan Version and user friendly desktop application that undoubtedly levels the international quality and fulfills all the requirements of the clients. Our School Management solution multi-user version desktop application that helps to keep up all records of students, teachers, non-teaching staffs, library, hostels, transport, fees, salaries and leave. 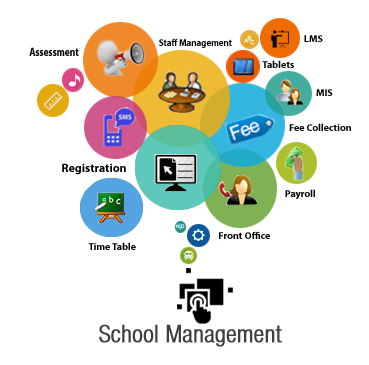 In short, # it helps to organize all aspects of an educational institution. In other words our school software is an enhanced tool that assists in organizing the day to day activities of the school. 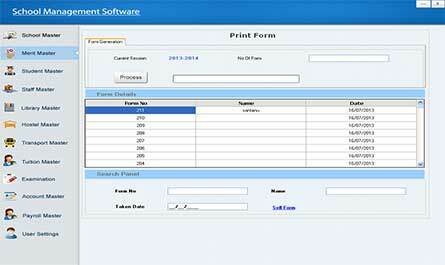 So as, our software keeps records thus, it facilitates to print out all types of possible records. Moreover, application forms for admission are automatically generated. 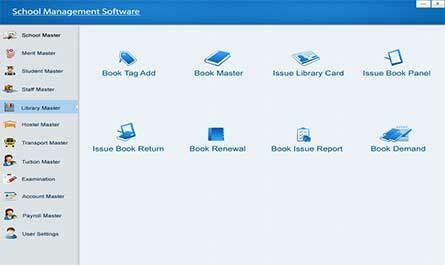 Industry Standard: Our School Management Solution is fully compliant with all existing affiliating board directives. 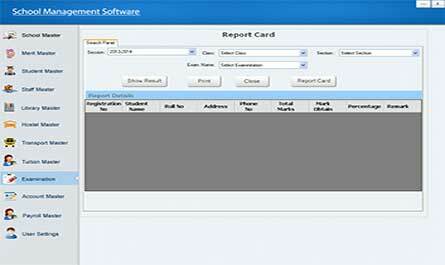 The system allows users to produce reports quickly conforming to the board formats. User Friendly: It is so easy to handle that a new user can learn to use this application in one day with little effort. Highly Customizable: The requirements and work process will differ with each institution and our School Management Solution offers limitless customization to suite your every need. Highly Secure: Our application offers ultimate security for data. Data can only be accessed by authorized personnel using a unique id and encrypted password. Graphical and Custom Reports: Reports are generated in multiple formats like adobe PDF and Microsoft Excel or Microsoft Word. Reports can also be sent directly to the printer. Scalable: Our School Management Solution is totally scalable to match the level of growth of the school, and grow to aptly support it in number of installations and product features. 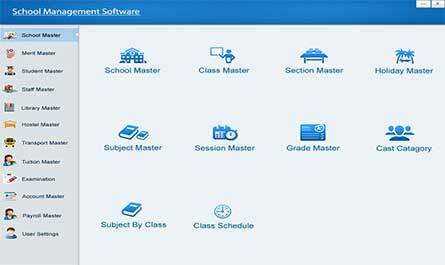 BC Software Services provides School Management Solutions for all Educational Institutions. This is desktop application. So it is not dependant on the server. Sometimes server may be down or slow or internet connectivity problems, these reasons slow down your work. So our desktop application overcomes this problem easily. Add, edit, delete class, section, session, subject etc. Keep up all the records of the students such as student’s registration number, class wise students, session wise students etc. Keep up staff details such as employee’s joining, registration, attendance etc. Keep up records of books of the library such as a particular book details, book number, library card issue, book issue, book renewal etc. There is a facility to keep up the records and manage of room allocation of the hostels. A school or colleges need vehicles for various aspects. So there need keep up records of vehicles. 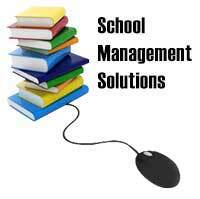 Our School Management Software has provisions to fulfill this need. As this is an educational institution, so there must be examination. So there need to maintain the examination schedule, subjects, results etc. Our software provides this facility meticulously. Other key points are employee salary, Students tuition fees, Institution’s accounts etc. This module is for admission of new students. 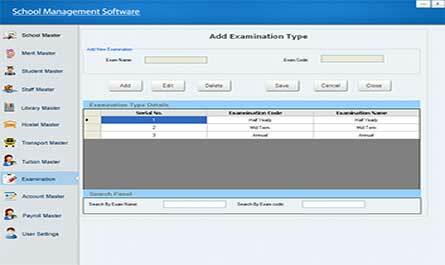 This module allows the user to generate form, keep the merit test records of the students and show or print the merit list. In this module user is allowed to keep general information of the newly admitted as well as the former students and their family like parents name, contact Number etc. 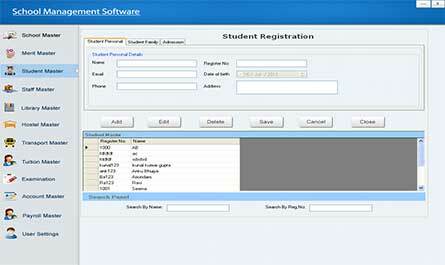 User can see or print record of any individual student. 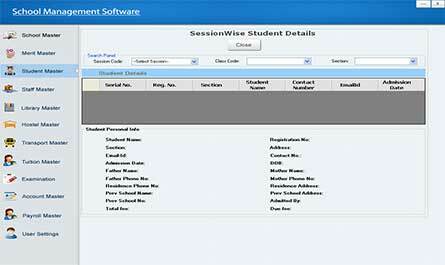 Class wise and session wise student’s records can also be seen in printable format. This module covers student’s fees structure. 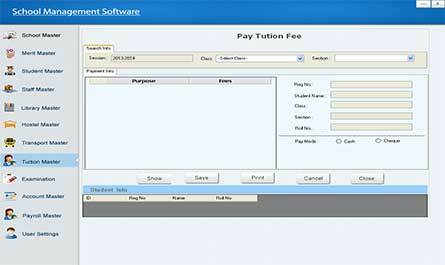 Such as add, edit, delete new fee, payment of fees, receipt against payment, due fees details report etc. In this module, user can generate employee joining form; keep up teacher’s registration records, non-teaching staff’s registration records, and teacher’s and non-teaching staff’s attendance report in printable format. This is also an important module. It helps to manage salary details of the staff. 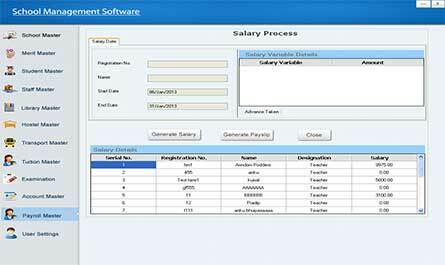 Such as, set salary variables, keep records of individual staff salary report, advance salary payment report, generate salary and pay slip, keep paid salary reports. 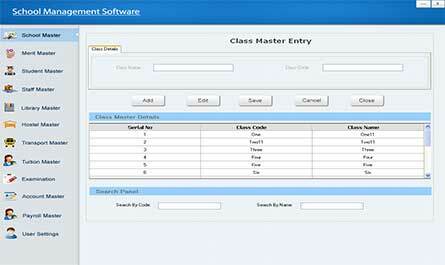 In this module the attendance of Teachers, Non-Teaching Staff and Students are recorded. Various type of reports like total number of students present in a class or in a section in a particular day or days can be generated in printable format. The attendance can be recorded either manually or by any Biometric Attendance System which is directly integrated with the main System. In this module Routine is prepared for every class and section. Subject is allotted for every period and Teacher is assigned subject wise. Various type of reports can be generated like routines of any particular Teacher or section is for any particular day or week. Account is very important part of any organization. 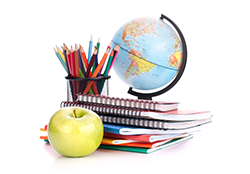 Schools or colleges have many sources of income and various types of expenses are incurred daily. Thereby it is too much important to maintain all records. 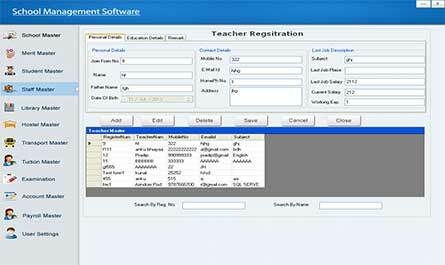 Our software helps to maintain accounts of school/college meticulously. Here user can create new head for both income and expenditure. There is option for both cash and cheque payment. 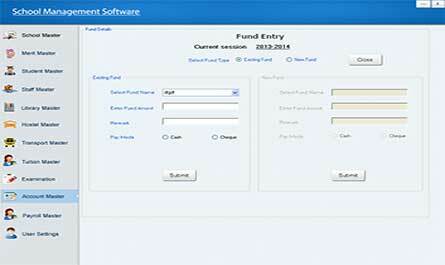 Keep records of general expenses and fund expenses. Reports can be generated in printable format for both general and other expenses. This module is to manage examination of the institute. 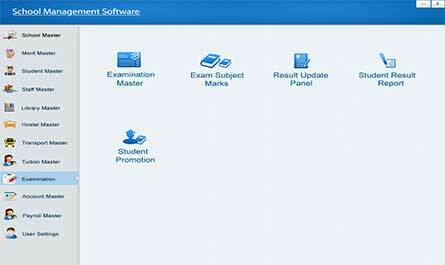 Here user can add, edit, delete examination terms, set subjects, exam wise marks, print report card, set student promotion etc. Every institution has to purchase some materials in a regular and custom basis from different suppliers. Therefore it has to maintain separate accounts. Besides, the Institution has to sell some materials like wastage paper etc. This module helps to keep all the records. 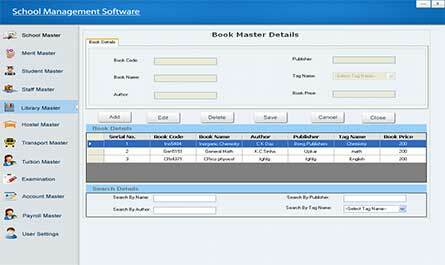 This module is to keep records and manage library books. 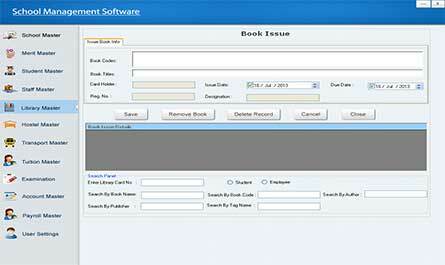 Such as add, edit, delete books’ tag, books’ details, issue library cards, issue books, issue book return, book renewal etc. 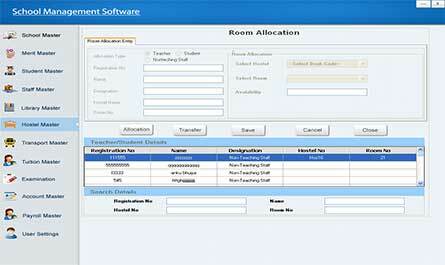 This module helps to manage hostel from a single desk. Allotment of room, room rent calculation etc. are done here. This module helps to manage vehicles and its route. This module is fully web based and it’s very innovative too. This module will be used by the Students, Parents of the Students and Teachers of the Institution. The Admin will be capable of uploading some data related Examination result, Examination schedule; total attendance of the students and any announcement etc. 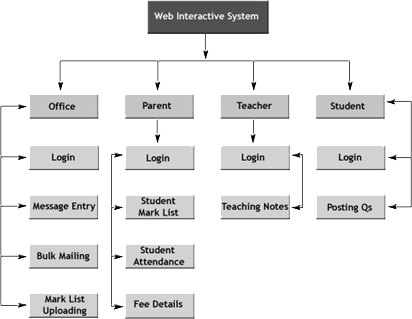 on the web server and the same will be accessed by the students, parents of the students and the teachers. There will be separate user ID and password for every student. The student will login with his/her user ID and password and he/she will be able to see all general information but in case of Examination result and attendance, he/ she will be able to see his or her own result. The teacher will be able to upload tuition and any suggestion for examination which will be accessed by the student by login with their user ID and password. Uploading Examination Schedule, Examination Result, Attendance of all student on Web Server. Uploading Tuition and Examination related suggestions. Information indirectly provided to the parents of the student about examination, attendance etc. There is a provision for user settings. 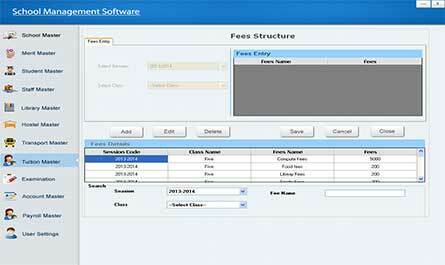 This part of the software provides the facility to create multi-user with separate permission. If you have any query then fill-up the following forms.